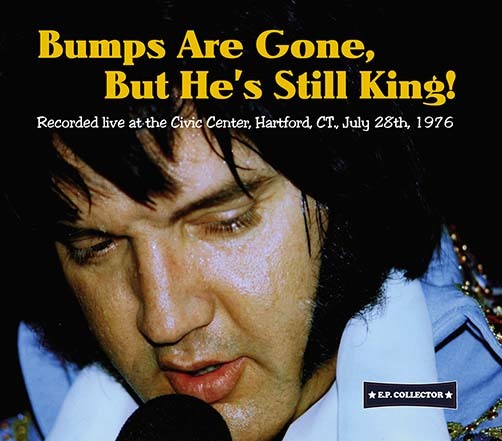 BUMPS ARE GONE BUT HE’S STILL KING! 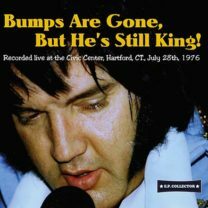 La E. P. Collector ha annunciato l’uscita di un nuovo cd intitolato “Bumps Are Gone But He’s Still King!” con il concerto del 28 luglio 1976 a Hartford. Questo show è stato pubblicato per la prima volta nel 2005 dalla Audionics con il titolo “Across The Country” in versione soundboard, ma incompleto. Ora, per la prima volta è possibile ascoltare integralmente il concerto in versione audience ed è una delle performance più lunghe di questo tour. Contiene bellissime versioni di “Jailhouse Rock”, “America”, “Polk Salad Annie” e “Hurt” e c’è anche un momento speciale in cui Elvis canta “Happy Birthday” a Kitty Kahane, figlia dell’amico di Elvis, Jackie Kahane. Il cd verrà rilasciato in versione digipack con una raccolta di foto tratte dal concerto. 01. Also Sprach Zarathustra (2001 Theme) – 02. C. C. Rider – 03. medley: I Got A Woman / Amen – 04. Love Me – 05. If You Love Me (Let Me Know) – 06. You Gave Me A Mountain – 07. All Shook Up – 08. medley: Teddy Bear / Don’t Be Cruel (medley) – 09. And I Love You So – 10. Jailhouse Rock (with reprise) – 11. Fever – 12. America (The Beautiful) (with reprise) – 13. Polk Salad Annie – 14. Band Introductions – 15. Early Mornin’ Rain – 16. Chicken Pickin’ / What’d I Say – 17. Johnny B. Goode – 18. Drum Solo (Ronnie Tutt) – 19. Bass Solo #1 (Blues – Jerry Scheff) – 20. Bass Solo #2 (Battle Of New Orleans – Jerry Scheff) – 21. Piano Solo (Tony Brown) – 22. Electric Piano Solo (David Briggs) – 23. Love Letters – 24. School Day – 25. Happy Birthday (to Kitty Kahane) – 26. Hurt (with reprise) – 27. Hound Dog – 28. Funny How Time Slips Away – 29. Hawaiian Wedding Song – 30. Can’t Help Falling In Love – 31. Closing Vamp.